Nafs (نَفْس) is an Arabic word occurring in the Qur'an and means self, psyche ego or soul. In the Quran, the word is used in both the individualistic (e.g. verse 2:48) and collective sense (verse 4:1), indicating that although humanity is united in possessing the qualities of a "soul/nafs/consciousness" they are individually responsible for exercising the agencies of their "free will" that it provides them. 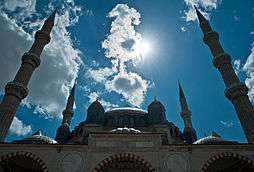 Much of the popular literature on nafs, however, is focused on the Sufi conceptions of the term. According to the Sufi philosophies, the nafs in its unrefined state, is "the ego", which they consider to be the lowest dimension of a person's inward existence, his animal and satanic nature. 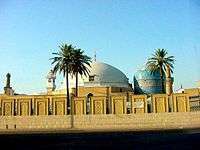 Nafs is an important concept in the Islamic tradition, especially within Sufism and the discipline of gnosis (irfan) in Shia Islam. The noun nafs has important instances in the Quran such as the following: "O you who have believed, upon you is [responsibility for] yourselves..." The major theme of the word nafs as used in the Quran is to instill a sense of individual responsibility through a strong emphasis on the choices made by the individual (as in 5:105), while at the same time reminding humanity of its common origins (verse 4:1). The Quran affords much importance to the 'nafs' of an individual, highlighting the agency of 'free will' and intelligence, without which neither responsibility nor accountability can exist. The Quran does not attribute to the 'nafs/self' any inherent properties of 'good' or 'evil', but instead conveys the idea that it is something which has to be nurtured and self-regulated, so that it can progress into becoming 'good' (or conversely, 'evil') through its thoughts and actions. The Quranic conception of the 'nafs' therefore has an extremely modernistic undertone, much like Nietzsche's conception of "Übermensch" or 'Superman', as suggested by Muhammad Iqbal, a prominent Muslim scholar and philosopher, who went as far as to accuse Nietzsche of borrowing the term from Islamic thought. Iqbal stated: "It is probable that Nietzsche borrowed it (Übermensch) from the literature of Islam or of the East and degraded it by his materialism." In its primitive stage the nafs incites us to commit evil: this is the nafs as the lower self, the base instincts. In the eponymous Sura of the Qur'an, Yusuf says "Yet I claim not that my nafs was innocent: Verily the nafs incites to evil. "[Quran 12:53] Islam emphasizes the importance of fighting the inciting nafs in Quran as well as in hadith. One tradition holds that Muhammad said after returning from a war, "We now return from the small struggle (Jihad Asghar) to the big struggle (Jihad Akbar)". His companions asked, "O prophet of God, what is the big struggle?" He replied, "The struggle against nafs." The Qur'an enjoins the faithful "to hinder the nafs from lust",[Quran 79:40] and another traditional narration warns that "the worst enemy you have is [the nafs] between your sides." Rumi warns of the nafs in its guise of religious hypocrisy, saying "the nafs has a rosary and a Koran in its right hand, and a scimitar and dagger in the sleeve." Animal imagery is often used to describe the nafs. A popular image is a donkey or unruly horse that must be trained and broken so that eventually it will bear its rider to the goal. Rumi compares the nafs to a camel that the hero Majnun, representing the intellect ('Aql), strains to turn in the direction of the dwelling-place of his beloved. In Sura al-Qiyama the Qur'an mentions "the self-accusing nafs". [Quran 75:2] This is the stage where "the conscience is awakened and the self accuses one for listening to one’s ego. One repents and asks for forgiveness." Here the nafs is inspired by your heart, sees the results of your actions, agrees with your brain, sees your weaknesses, and aspires to perfection. In Sura al-Fajr the Qur'an mentions "the nafs at peace". [Quran 89:27] This is the ideal stage of ego for Muslims. On this level one is firm in one’s faith and leaves bad manners behind. The soul becomes tranquil, at peace. At this stage, followers of Sufism have relieved themselves of all materialism and worldly problems and are satisfied with the will of God. Ta'Jeel or Swiftness. A good deed must be done immediately and there should be no laziness. Tehqeer or Contempt. You must look at your good acts with contempt otherwise you will become self-righteous. Ikhfa or Secrecy. You must keep your good acts secret otherwise people will praise you and it will make you self-righteous. According to the Qur'an, charity should be given both secretly and openly. In Muhammad Asad's translation of the Qur'an, 14:31 reads: "[And] tell [those of] My servants who have attained to faith that they should be constant in prayer and spend [in Our way], secretly and openly, out of what We provide for them as sustenance, ere there come a Day when there will be no bargaining, and no mutual befriending." The stage comes after the 3rd principal stage. On this level "one is pleased with whatever comes from Allah and doesn’t live in the past or future, but in the moment." "One thinks always: ‘Ilahi Anta Maqsudi wa ridhaka matlubi’. One always sees oneself as weak and in need of Allah." On this level the two Ruhs in man "have made peace". "One is soft and tolerant with people and has good Akhlaq (Arabic: أخلاق), good manners." On this level "one is dressed in the attributes of the Insan Kamil, the perfected man, who is completely surrendered and inspired by Allah." One is "in full agreement with the Will of Allah". Dervishes from the Jerrahi school of Sufism are encouraged to study a text describing these stages of nafs as a nested series of cities. ↑ Chittick, William (1983). The Sufi Path of Love. State University of New York Press. p. 12. ISBN 0-87395-724-5. ↑ "The Quranic Arabic Corpus - Quran Dictionary". ↑ "Surah Al-Ma'idah - The Noble Qur'an - القرآن الكريم". ↑ "IQBAL'S CRITICISM OF NIETZSCHE". ↑ "20th WCP: The Neoplatonist Roots of Sufi Philosophy". ↑ Shah, Idries (2001). The Sufis. London, UK: Octagon Press. pp. 394–395. ISBN 0-86304-020-9. 1 2 Frager, Robert (1999). Heart, Self and Soul. Quest Books. pp. 54–88. ISBN 0-8356-0778-X. An imprint of the Theosophical Publishing House. ↑ Schimmel, Annemarie (1975). Mystical Dimensions of Islam. University of South Carolina Press. pp. 112–114. ↑ Robert Frager. Heart,Self & Soul. ↑ "Surah Al-A'la - Arabic Text with Urdu and English Translation". ↑ Kabbani, Hisham. "Jihad Al Akbar". Retrieved 17 January 2010. ↑ Nicholson, Reynold Alleyne (2008). The Kitab Al-Luma Fi L-Tasawwuf Of Abu Nasr Abdallah B. Ali Al-Sarraj Al-Tusi: Edited For The First Time, With Critical Notes And Abstract (1914) by Reynold Alleyne Nicholson. Kessinger Publishing. 1 2 Nicholson, Reynold (1990). Mathnawi of Jalaluddin Rumi. Warminster: Gibb Memorial Trust. ISBN 0-906094-27-5. ↑ Nicholson, Reynold (2008). The Kashf Al-Mahjub: The Oldest Persian Treatise On Sufism (1911). Kessinger Publishing. ISBN 0-548-94106-8. The three rules of Abbas Bin Abdul Muttalib and the section on Characteristics of nafs are translations from the Persian text Shahid ul Wojood, written two hundred years ago.